Our large size, zip-lock bag of Faraon Mayacoba Beans is packed for the consumer who wants to buy bulk and yet get the Faraon quality for maximum enjoyment. Our 8 kilo size offers an attractive per pound price in a quality controlled package. 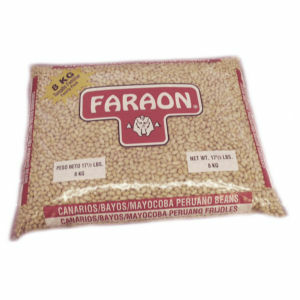 Faraon Mayacoba Beans cook tender, creamy, whole and are absolutely delicious in a vegetarian plate or as main dish with your favorite meat. It is also a dieters delight with large amounts of fiber and no fat per serving. Good and good for you!